Man is far beyond the physical existence; even beyond the emotions and the mind. Man, in its essence, is a spiritual being, a soul with different bodies, shown as an inverted tree with its roots spreading upwards. 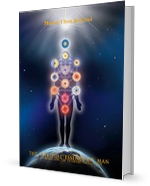 The Spiritual Essence of Man is a unique course that reveals the true nature of man and leads to the experience of the divine essence within your chakras and your aura. Chakras are known as whirling energy centers that control and energize the vital internal organs in the body, they are therefore responsible for the proper functioning of the human body and its health. Chakras, beside physical functions, also have psychological and spiritual functions. This workshop helps you to know yourself better on all levels. The Kabbalistic Tree of Life is discussed and explained, accompanied by graphs and numerous colored illustrations to show the correspondences to the physical body and how it relates to our lives – in any religion or belief set.